We love seeing small businesses prosper in Hendricks County. 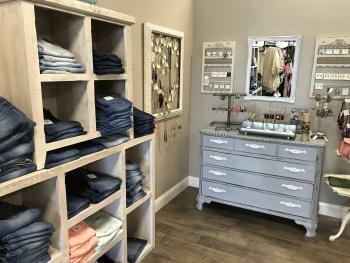 Sweet M&apos;s Boutique&apos;s recent move to a new location is a perfect example. It&apos;s impressive. Just a little over a year ago, this boutique launched as an online clothing store and opened their brick-and-mortar store a few months later. A recent change in location will likely bring in new customers and allow this growing business to keep on keeping on. More Visible - I loved their old location, but it wasn&apos;t the easiest to find especially if you didn&apos;t know to look for it. 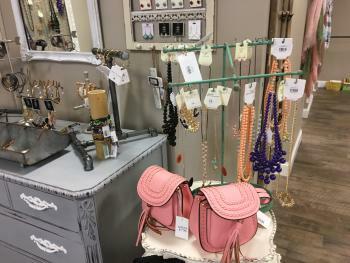 Now, just a few blocks away, you&apos;ll find Sweet M&apos;s Boutique, 302 Dan Jones Road in Plainfield, without any trouble. More Room - Their old location could get a little, um, crowded. This is not a bad problem to have, of course, but the new location definitely made browsing a lot easier and enjoyable. More Space for More Product - My daughter and I definitely felt like they had more sizes and even more variety on the floor at their new location. It&apos;s really awesome to think about the success and growth of this small business in such a short amount of time. This change in location brings about some great opportunities for both owner and customers, but I&apos;m happy to report that all the things us regular customers knew and loved about Sweet M&apos;s remain. For those not previously introduced, here are a few details about the boutique. Women&apos;s Clothing - All the latest trends and styles in sizes XS-3X. Jeans, leggings, tunics, dresses and every kind of top your heart could hope for. Children&apos;s Clothing - Their Little M&apos;s section is packed with boutique fashion for the little ones and will leave you asking "Do you have this in my size?" All the Shoes - Just like their clothing and accessories, Sweet M&apos;s works hard to offer all of the current season&apos;s trends in footwear with prices that are equally impressive. Boots, sandals, flats -- they&apos;ve got&apos;em. Jewelry and Accessories - They offer all the best purses, jewelry, scarves, hats and gifts. They currently have an adorable collection of baseball hats that are perfect for summer. Their wide selection of faith-based and inspirational necklaces and bracelets will compliment any wardrobe and also make great gifts. I have a few friends that shop almost exclusively at Sweet M&apos;s and they tell me, on good authority, that their jeans are the best that money can buy. Comfortable, available in a variety of colors and styles, durable and incredibly cheap. One of my good friends is verging on an obsession with any top they offer in stripes and floral print. My daughter left with a leather wrap bracelet with her favorite Bible verse etched on it. I&apos;ll surely be borrowing that. I purchased a tank tunic that I knotted and wore to work with leggings on a day that I could not will myself to wear another pair of dress pants. I threw on a chunky necklace and printed flats and boom, I was work ready, yet still comfortable. Although their store front is something special, you can still shop Sweet M&apos;s online and get additional information about their story here. You should also follow their Facebook for all the latest news and to see what new styles they offer. 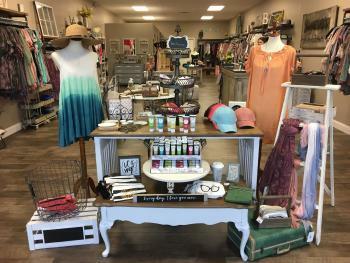 You can stop in and shop their brick-and-mortar boutique Monday - Saturday from 10 a.m.- 6 p.m.
I&apos;m certain you&apos;ll love it.